What base and plate should you use? How to care for your plates? How to prepare digital files? Keeping sharp eye on the lookout for more cool things & intriguing “must-bookmark-this!” items, this week’s installment of the Inquisitive Printers Want to Know features a Wisconsin-based printer and bookmaker, a new specialized coating that is the “blackest of the blacks”, and a celebration for a book series that inspires one of our printers. Read on to learn more! Cathy: I recently found a website with a blog that pleased me. It is called Letterpress Book Publishing and it belongs to Mike Coughlin of Superior Letterpress of Cornucopia Wisconsin. He calls himself a Printer and Book Maker and his blog reflects on his love of his profession. His posts are comfortable and friendly. He hasn’t posted since December 2017 so I am hoping some new visitors to his page will prompt him to give us something new to read. He is at the tip of Wisconsin before it drops into Lake Superior so come “chat” with the rest of us, Mike, and let us know what is on your mind or on your press. 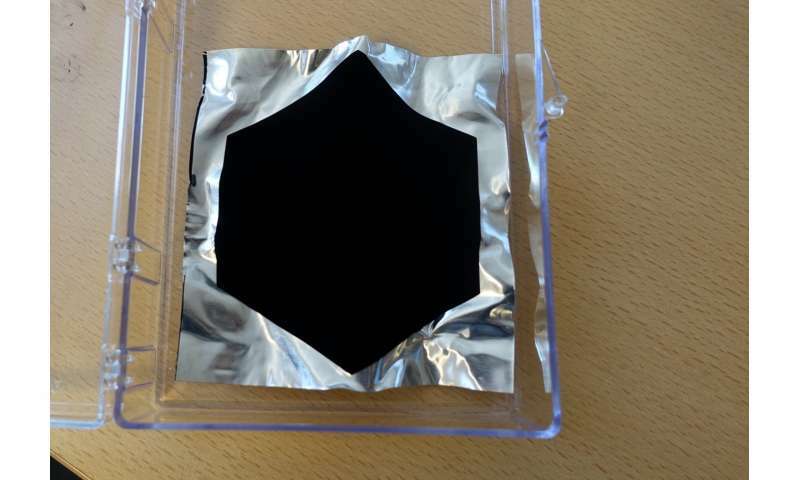 Rebecca Miller: While we do love a good, deep rich printing black (a printer’s bread and butter), we often wonder about Vantablack. Hailed as the “blackest of blacks”, this is borderline cartoonish-ly black coating is neither really a pigment nor paint per se. Instead, the specialized coating (made by Surrey Nanosystems) is made up of series of long, extremely tightly packed (and quite microscopically thin) carbon tubes. So dense is this “forest of carbon nanotubes” that any light shined onto it is immediately absorbed (99.96% to be exact). The very precise need for those densely packed carbon nano tubes to be laid in a certain way limits how the coating can be applied. Currently in the works is a not-as-dark version in a spray variety aimed at the STEM community (and it will set you back a pretty penny). Bonus: The “Vanta” in Vantablack stands for “Vertically Aligned Nanotube Array”. Leanna: Happy Birthday, Harry (July 31st)! I have been a huge Harry Potter fan since it was introduced to me by my fourth grade teacher. It was subsequently banned from the school a couple months later, so I had to sneak it in my lunchbox to read during break. Over the years since last book and film were released, I took to mainly searching Pinterest for fan art and periodically listening to the audiobooks while I work in the shop (and people wonder why I’m tearing up at the press, it’s cause I’m listening to Snape die for the 100th time!). Did you know that 2018 is one of the years in which the book ‘The Cursed Child’ takes place? According to the timeline, Harry’s first year at Hogwarts is 1991. The Battle of Hogwarts is in 1998 making the “19 years later” of the epilogue of ‘The Cursed Child’ to be in 2017. Weird right? Now imagine the movies taking place in the early 90’s instead of the 2000’s! In honor of Harry’s and J.K. Rowling’s birthday today, here are a few of my favorite Harry Potter things to inspire a bit of “magic” for their next print project! Do you have a cool thing you’d like to share with us or see something that tickles your printing fancy? Email us at info@boxcarpress.com as we’d love to hear from you! We’re always on the look-out for fun + wonderful things! 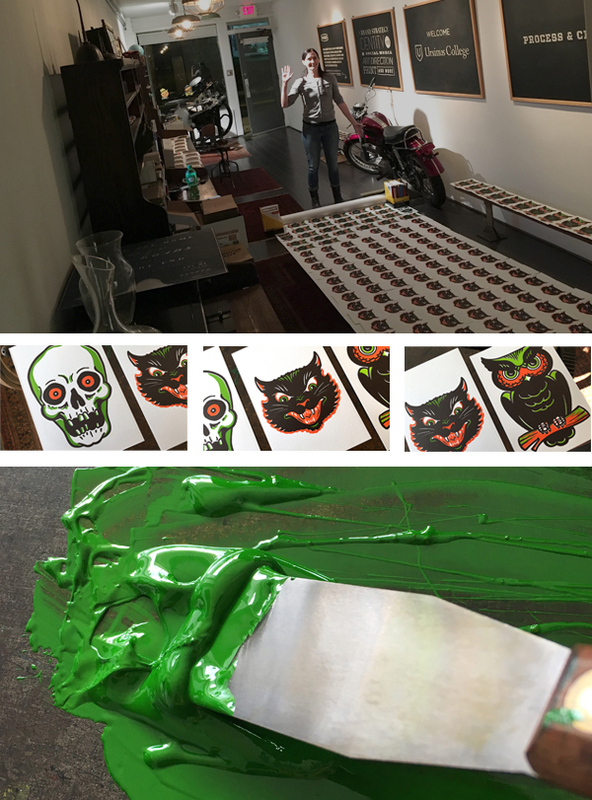 In search of the perfect printing ink – why not do it yourself? 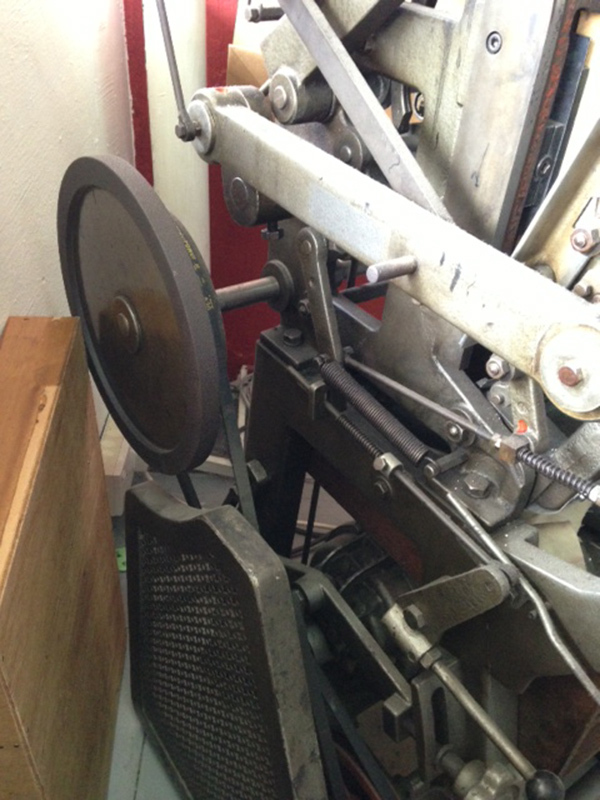 Letterpress printers have many tools at their disposal, such as presswash, line gauges and quoins. Not the least of these is their favored printing ink. Broach this subject with a group of printers in person or an online forum and most can hotly debate the one they can’t live without. 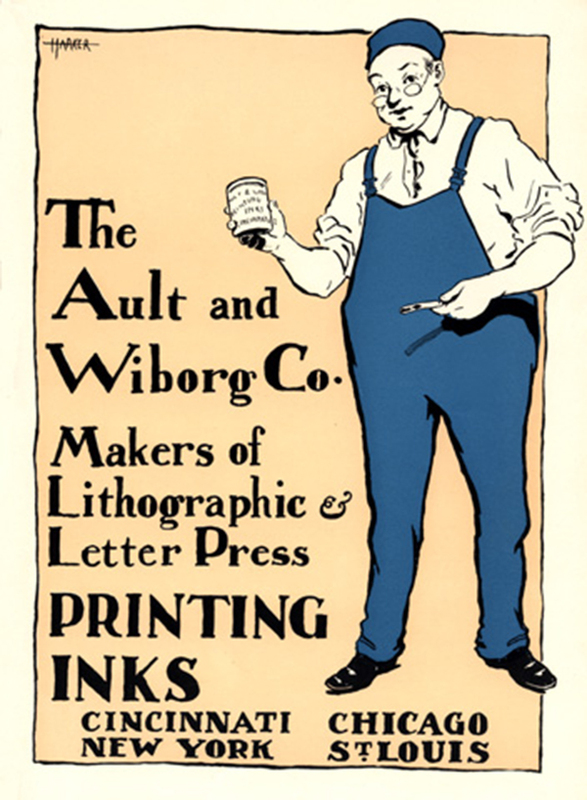 Yes, we are going to step into that debate and ask specifically which black printing ink do you hold in high esteem but before we do that, we want to entertain you with an article from a book that gives the recipe for making your own. Looks pretty simple to us but you decide. Six Hundred Receipts, Worth Their Weight in Gold by John Marquardt of Lebanon, PA. Turn to page 75 – Receipt No. 138 How to make Black Printer’s Ink. “Printers’ ink is a real black paint, composed of lampblack and linseed-oil, which has undergone a degree of heat superior to that of common drying oils. The manner of preparing it is extremely simple. Boil the linseed-oil in a large iron pot for 8 hours, adding to it bits of toasted bread the purpose of absorbing the water contained in the oil; let it rest till the following morning, and then expose it to the same degree of heat for 8 hours more, or till it has acquired the consistence required; then add lamp-black worked up with a mixture of oil of turpentine and turpentine. The consistence depends on the degree of heat given to the oil, and the quantity of lampblack mixed up with it; and this consistence is regulated by the strength of the paper for which the ink is intended. If one receipt isn’t enough, another is available on page 264 , No. 597 An Excellent Printing-Ink. In case you are wondering – the drachms is a unit of weight formerly used by apothecaries, equivalent to 60 grains or one eighth of an ounce. Letterpress printers, as a group, seem to be interested in trying new things for their art, so we hope that these two recipes might get a try-out or two from someone. However, it is also fun to note that within the 598 other receipts in this book, you can also find a recipe for peppermint cordial, a cure for the bite of a mad dog, and treatment for scabby heads on children and toothaches. Back to our original question, we truly are interested in hearing about your favorite black printing ink, either ones you have used in the past and can’t find anymore or one you use everyday. Tell us in the comments below! 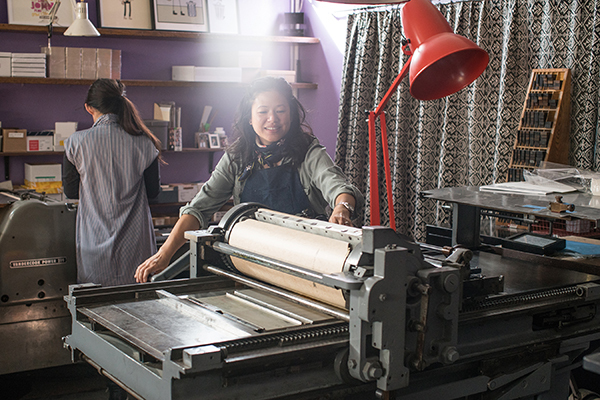 Graphic-designer-turned-letterpress printer Carrie LeGrow of Callidora Letterpress + Design balances airy & dreamy perfect prints and full-time family life with creative flair to spare. From chancing upon a dusty printing press to settling into her home studio, Carrie has taken the plunge into letterpress and revels daily in the inspiration that a bit of ink, a loving & supportive family, and marveling in the little things that (printing) life can bring. A PRINTING DISCOVERY My name is Carrie LeGrow and I am a designer, letterpress printer, wife, and mama to two amazing little girls ages 2.5 and 2 months. 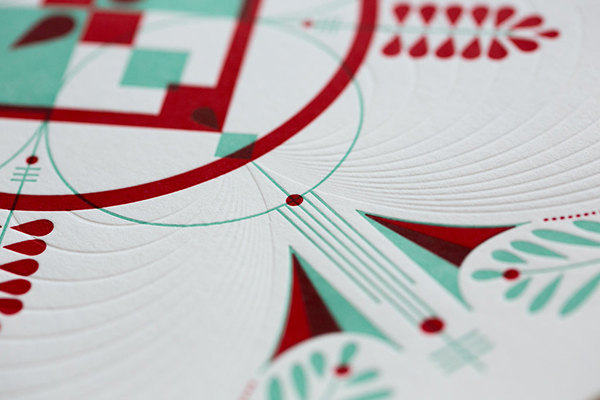 I have a BFA in graphic design and have always been drawn to the beauty of letterpress printing. I learned the art of letterpress printing shortly after receiving my degree in 2007 and happen to discover a 500lb antique printing press collecting dust in a garage in Rhode Island. Over the course of a year, I restored the old press and it is finally at home in my home studio. 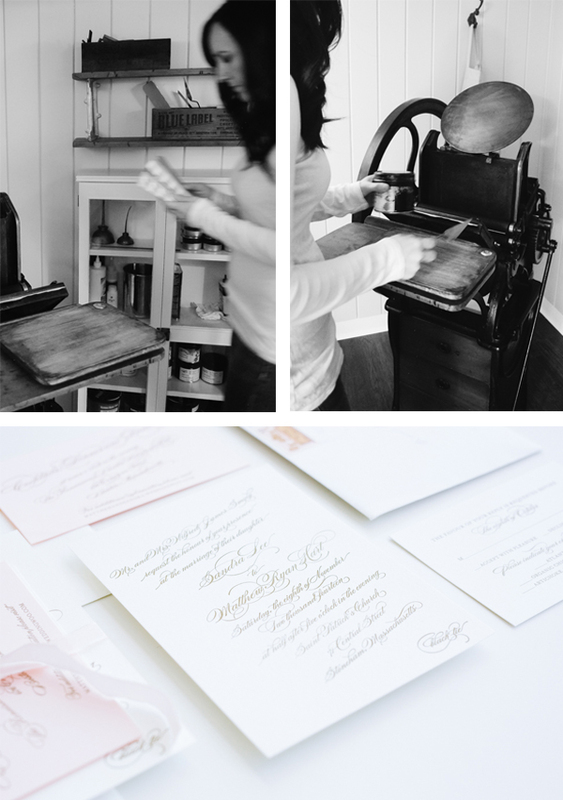 All of Callidora’s letterpress pieces are printed by hand printed on my Golding Pearl Press, circa 1880. THE DRAW OF LETTERPRESS I first got involved in letterpress by taking a one-day class offered by a local print shop. I wanted to get my feet wet and see what letterpress was all about. Of course I loved everything about it so I then signed up for a two-day course at Montserrat College of Art. And those two experiences are the extent of my “formal training”. After those courses, I decided to buy a press I came across on Craigslist. With my little Golding Pearl and minimal printing supplies, I got printing. I read a lot of blogs, watched a lot of tutorials and had a lot of trial and error. My first “job” was when I was asked to design and letterpress print a friends’ wedding invitations and the accessories that complemented their event. From there “Callidora” was born. As I said, I have always been drawn to the beauty of letterpress printing. There is something about the tactile nature of a letterpress printed piece that was just love at first sight for me. I am also drawn to how each printed piece is given an impression that cannot be replicated by other printing methods. I find myself staring at my work from all different angles just so I can see the impression as the light hits… it is just swoon worthy. I also love the process of designing on the computer and then handcrafting those pieces to life. Hand-feeding each piece of paper and each envelope into an antique press one sheet at a time, one color at a time is so rewarding. When you design mostly on a computer and then send that PDF away for a printing plate, it satisfies me to get that piece on press and have it come to live in such a tactile way. BEAUTY IN THE BAY STATE My studio is located in my home on the North Shore of Massachusetts in Topsfield. With a young family, logistically, a home studio just works for me right now. I stay at home with my girls and split my time between them and working for myself. I am able to hop down to my studio and do the naptime hustle when both girls are sleeping. I am also able to work at night and on the weekends but still be close if anyone needs me. My husband totally redid the entire space for me after we moved into our home in 2012. It is cozy and has everything I need for a small print shop … the only thing we are trying to figure out is how to get my recently purchased 800lb+ Golding Jobber down a flight of steps. Topsfield is a really historic, small town. We are lucky enough to have a few wedding venues and I am a preferred vendor at the Willowdale Estate, located in Bradley Palmer State Park. We also have a quaint downtown with a bakeshop (The Topsfield Bakeshop). They specialize in all kinds of whoopies (so good!) and and I am a sucker for their chai tea latte. PRINTING INSPIRATION I am mostly self-taught in the art of letterpress so I do not really have any printing mentors, but there are so many fabulous printers out there doing such beautiful work and I am so inspired by them. Every time I am on Instagram I feel like I am discovering someone new that I am in love with. That is mostly where I go to get inspired and crush on other artists. DESIGNED FOR PRINT I am a designer and printer, exclusively printing my own designs. I have a BFA in graphic design and have worked at various fashion lifestyle companies and a few smaller advertising agencies as a graphic designer. During my whole career I have always loved creating art on the computer. Now as a printer, I get so much joy in not only creating, but printing and handcrafting my own pieces. It is the ultimate for me. Also, because of my design background, I will often incorporate digital printing with letterpress. 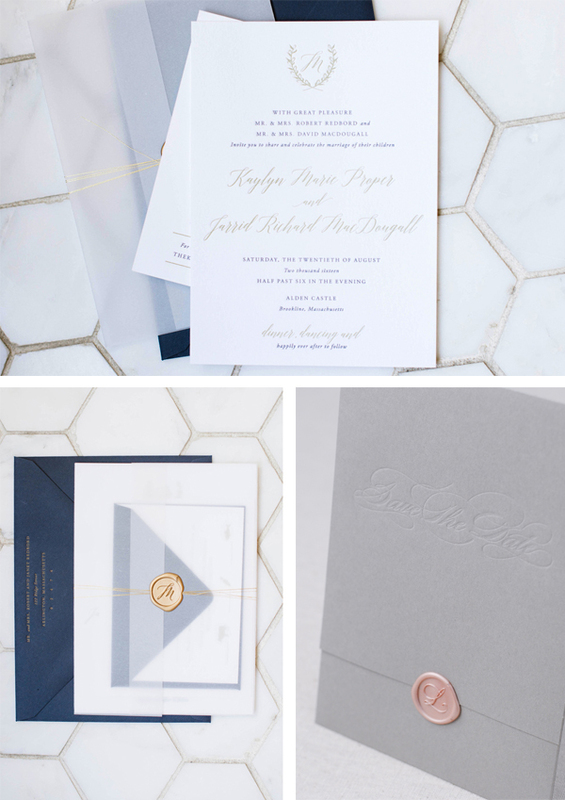 All of my wedding suites are entirely custom, which includes custom design and handcrafted, letterpress printed invitation suite. 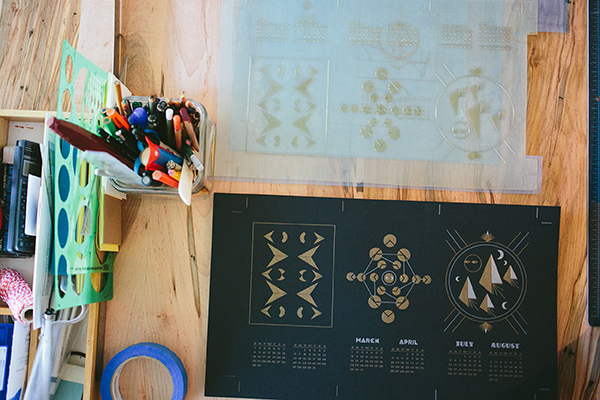 From design to letterpress printing, I handle every step of the design and invitation process. This ensures that I have complete control over the quality of my product at all times. 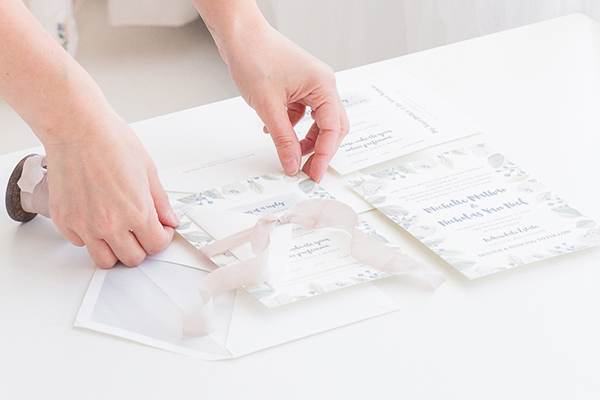 I have yet to outsource any piece of Callidora’s invitation suites, which include everything from envelope lines to sewn photographs to letterpress linen hang-tags. PART-TIME PRINTER, FULL-TIME FUN I stay at home with my two young girls and split my time between them and working for myself. When they are a bit older and in school, I plan to be taking Callidora full-time. PRINTING FEATS I am really pound of making Callidora Letterpress + Design happen. It has been a dream of long standing that had finally come to fruition. During my entire career as a graphic designer, I would print here and there on the side. 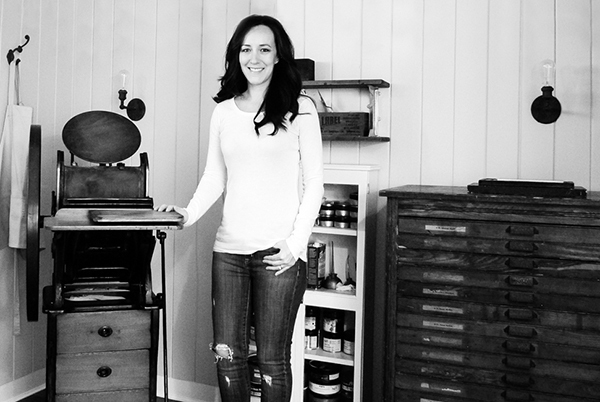 I always dreamed about opening my own letterpress and design studio. When my first daughter was born in 2014 I decided not to return to work full-time. I knew that this was the time to see if I could make a go at it. I took on a handful of wedding clients that year and am blessed that brides keep seeking me out ever since. PRESS HISTORY My first press was a Golding Pearl Old Style #3. I print mostly stationery and wedding suites, and since everything is around a 5×7 size and smaller it is actually still my main press. BOXCAR’S ROLE I would not be able to so seamlessly letterpress print my designs if it were not for Boxcar Press. I use the base with the polymer plates and it is a game changer for sure. They are reliable and consistent and that is very important when you have tight deadlines with wedding clients. SHOP TIPS If you run into a press or printing issue, go on briarpress.com. I have solved so many problems and gained a wealth of knowledge from their discussion pages. WHAT’S NEXT In 2017 I hope to continue working with wonderful clients. I love working with brides on their wedding invitations, new parents on birth announcements, families on party invitations and many more custom designs for special moments. I have a true passion for creating and making exquisite pieces that feel less like invitations and cards and more like beautiful gifts. 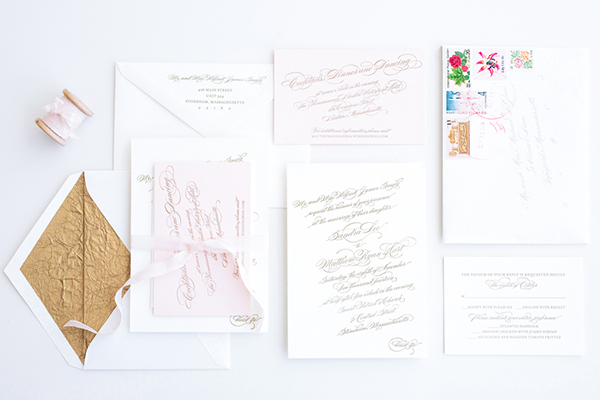 Immensely big round of applause out to Carrie of the ever-elegant Callidora Letterpress + Design! Her amazing journey is an inspiration to us all here! 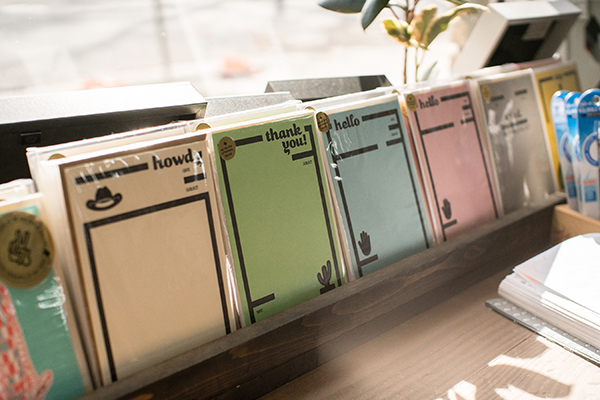 The creative trio behind WE ARE 1976 effortlessly combines fun, eclectic, and world-wide inspirations to create hand-made letterpress paper goods in the heart of Dallas, Texas. 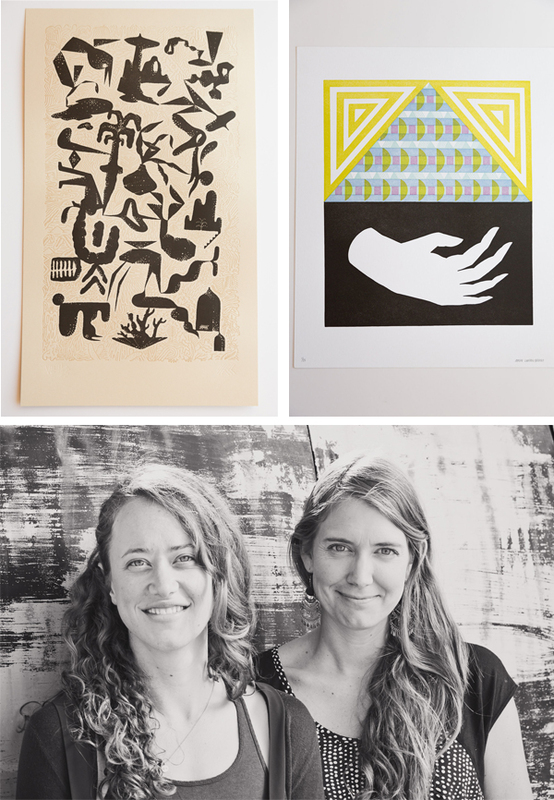 From punches of color to fun & funky illustrations & prints, the shop is a happy culmination of the team’s love of learning, community printmaking workshops, and the ambition to keep the creative juices flowing. The crew caught us up on eight (and counting!) joyous years honing their craft, incorporating letterpress in their day-to-day lives, and enjoying the rich printing community that surrounds them. FUNKY + FUN Hello! 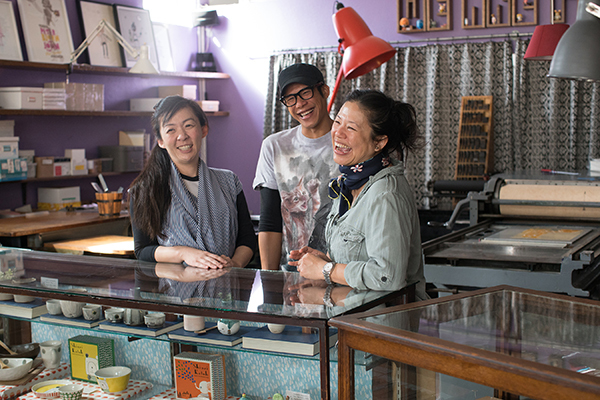 We’re Vynsie, Jully, and Derek and we own a small shop and letterpress design studio in Dallas, Texas called WE ARE 1976. We opened our shop 8 years ago and we carry handmade and beautifully designed objects (ceramics, jewelry, and home goods) and paper goods (stationery, cards, and prints) from independent makers from all over the world. 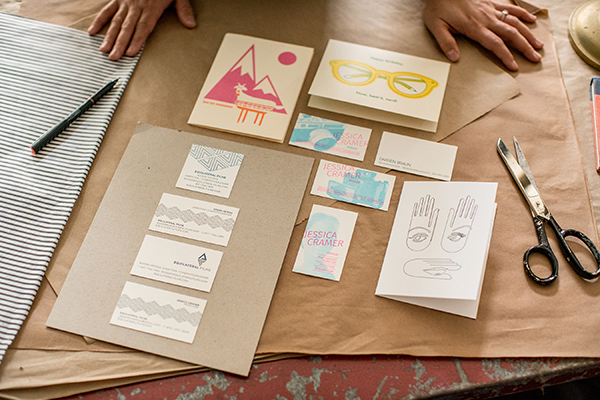 About four years ago, we started making our own line of stationery and art prints and have added custom branding, design, and letterpress printing to what we offer. We also teach printmaking workshops and host guest instructors that teach workshops such as calligraphy, water coloring, and jewelry stamping. We all grew up around the Dallas area and love being a part of the creative community here. FIRST TASTE OF PRINTING Vynsie’s background is in graphic design. She got her first taste of letterpress and antique printmaking techniques at Graham Bignell’s Paper Conservation in London many years ago (cleaning old type cabinets in exchange for press time). She also worked at Peter Harrington’s Rare Books (at their sister antiquarian print shop, formerly known as Old Church Galleries) which deals in rare books and antique prints made from wood, copper and steel engravings. 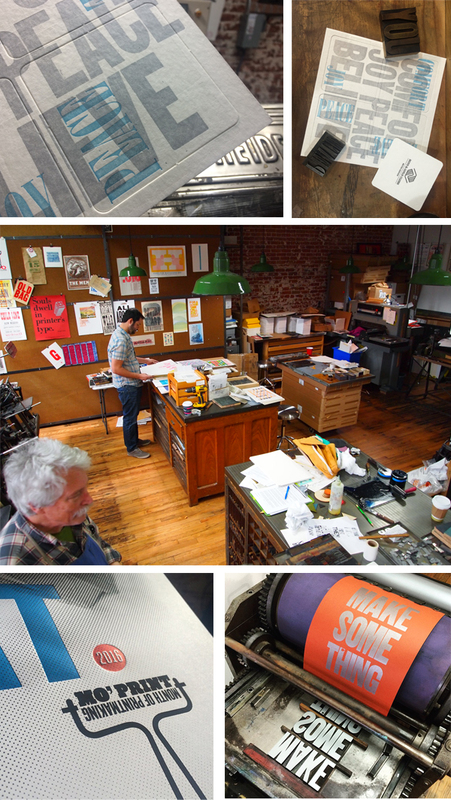 We carried the same vision and love of printmaking when we started our business. We have a diverse collection of art prints from illustrators, designers, printers (letterpress and screenprint) from the United States, Europe, Japan and Australia. Dallas also has a really tight letterpress community and we’ve been fortunate enough to get to work with them in various ways – the amazing people at Inky Lips Press, Missing Q Press, Color Box Studio, and Studio 204 were very generous with their time, expertise, and the work they shared in our shop. 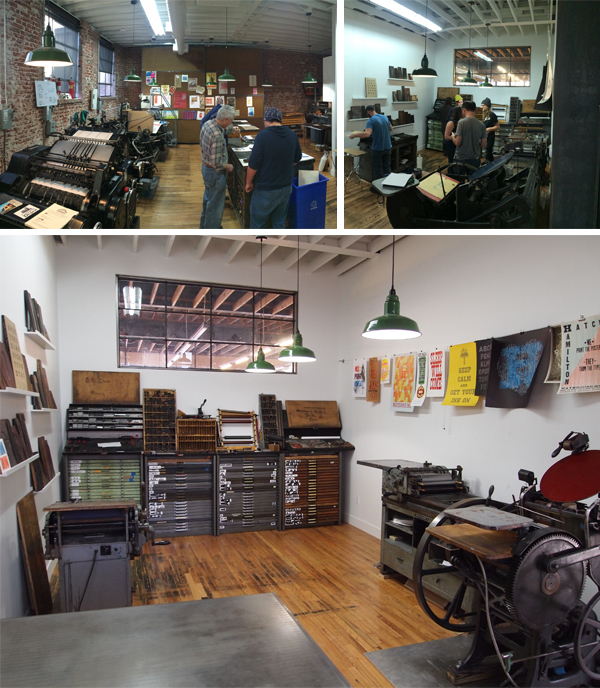 Five years ago we decided to make letterpress a permanent part of our shop. 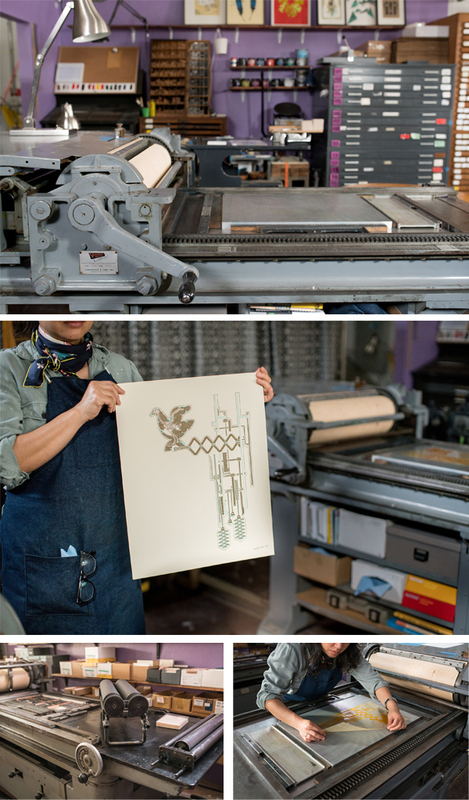 We started taking more letterpress workshops from places like Punch Press in Austin and San Francisco Center of the Book and with a bit of patience, we were able to locate two presses. We started printing immediately, teaching ourselves and each other. BIG PRINTS IN TEXAS We moved to our current location because we needed a bigger space to fit our letterpress studio, which takes about half of our shop space. 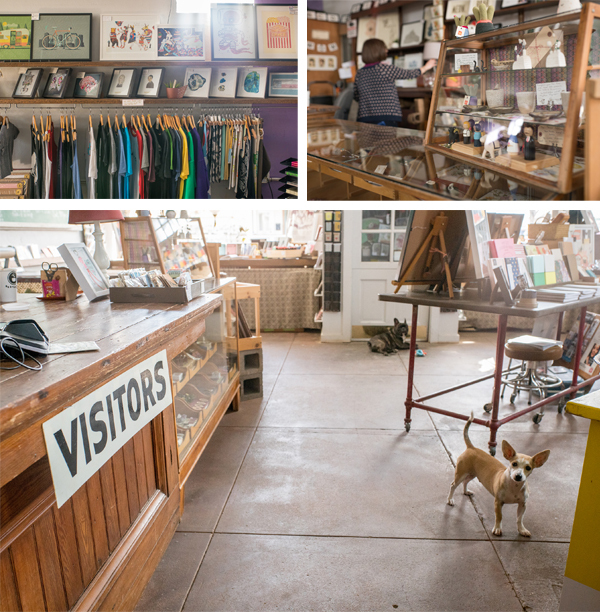 We’re in a charming historic district called The Bishop Arts District in Oak Cliff, Dallas. We’re across the street from a wonderful pie shop, Emporium Pies, and cute shops like Green Pet, Neighborhood, and Wild Detective. Most of the businesses are independently owned and we feel incredibly lucky to be here. There’s also amazing food and drinks on every corner in Oak Cliff – Small Brewpub, Hattie’s, El Si Hay and Spiral Diner. Also, The Texas Theatre is a revitalized theatre with independent programming, fun events, and they host new art exhibitions monthly at their Safe Room gallery. 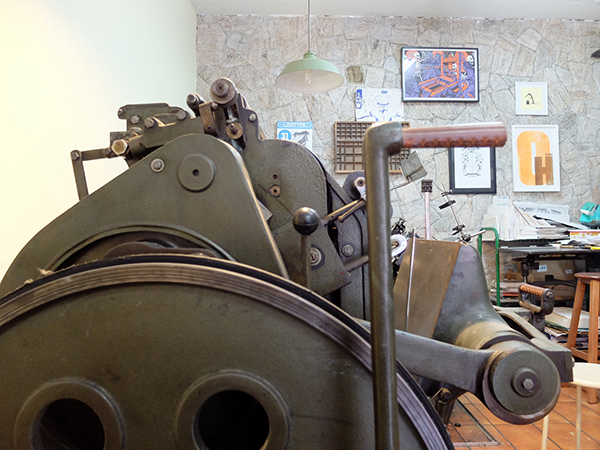 PRINTING MENTORS One of our presses is from the Art Larson’s Studio Hortan Tank Graphics. When the press was shipped to use, his colleague Joe Riedel came down to help us set up and was invaluable in teaching us the fundamentals of running and operating our presses. 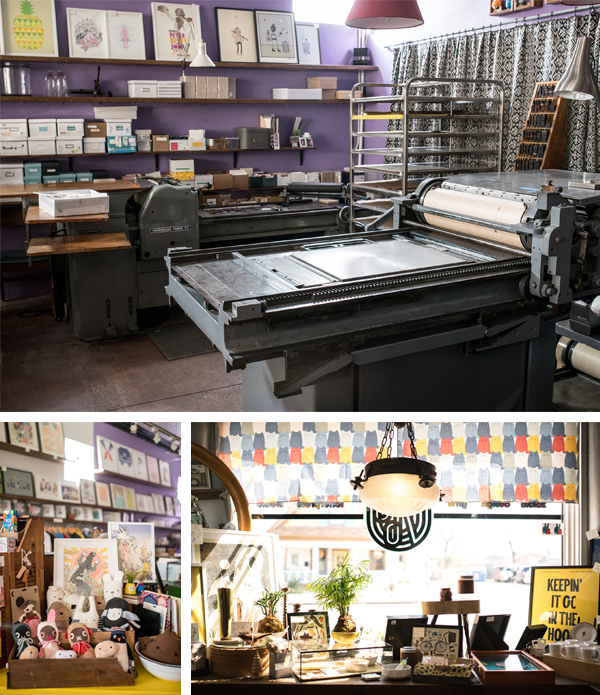 And, as mentioned above, we were really encouraged and motivated by many in the Dallas letterpress circle – Casey McGarr of Inky Lips Press, Jason McDaniels of Missing Q Press, Rhona Warren of Color Box Studio and Kim Neiman and Virgil Scott of Studio 204. 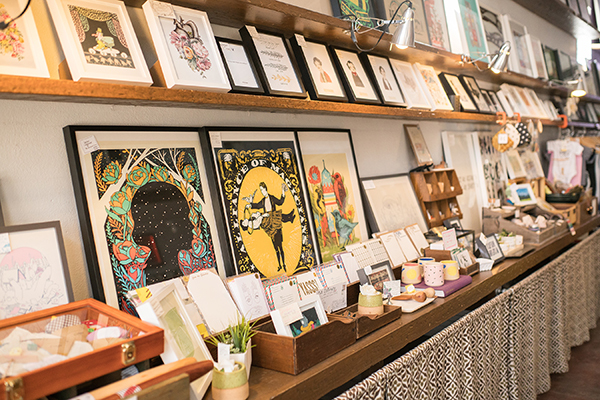 Also, in our shop, we carry work from other illustrators/printmakers that really inspire us – Daria Tessler, Nate Duvall, Naoshi, Deth P Sun and Kelly Puissegur. DESIGNERS + PRINTERS We’re both. We’re a family business and work on most projects together whether it’s just exchanging ideas initially or packaging finished projects. It’s so important for us to create unique and beautifully crafted pieces for us and for our clients so there’s lots of discussion and brainstorming before we even start designing or printing. We usually go through a few rounds of roughs and concepts before we get to a finished piece. We have a nice collection of antique type, so we work on many typeset posters, digitally design work, and use Boxcar plates. FULL TIME FUN With our custom work, own line of stationery and our workshops we’ve been printing full-time for 4 years now. We’re lucky that we have really good team here so if we’re not printing that day, we’re designing something new, or trying to come up with new ideas. PRINTING FEATS As simple as this sounds, just operating these complex machines is something we’re proud of. Whether it’s just servicing the press, troubleshooting to get the perfect impression, or finding a solution for a squeaky part, learning to trust our instinct with the mechanics of these antique presses while producing beautiful high quality print work brings a new kind of confidence that we don’t get from our normal day-to-day life. 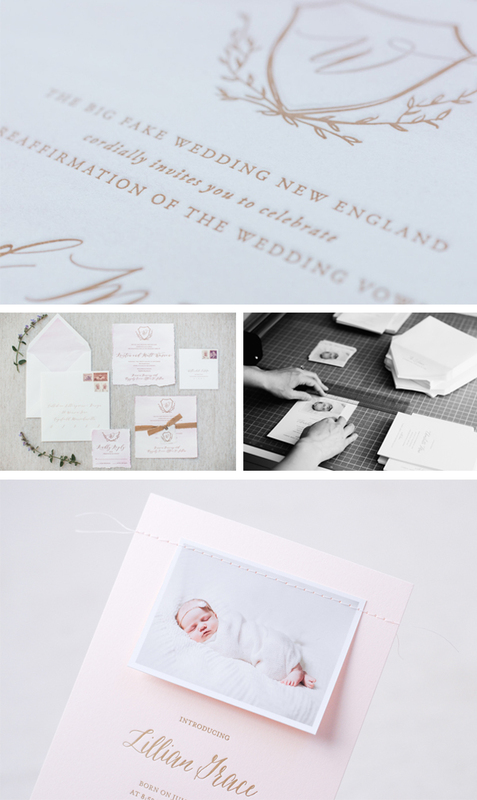 We’ve been very proud to do more custom work – wedding invitations, branding projects, personal stationery. All of these moments and projects are important to our our clients and we’re so honored to be a part of it. PRESS HISTORY Vandercook 325 and Challenge Proof Press. We have added a Vandercook 219 and tabletop Pilot. BOXCAR’S ROLE Boxcar has made it so much easier for us to create custom work for our clients and for our own line of paper goods. Super helpful with file prep questions and any changes or adjustments. WHAT’S NEXT Designing and printing more! An amazingly large round of thanks out to Vynsie + team of WE ARE 1976. 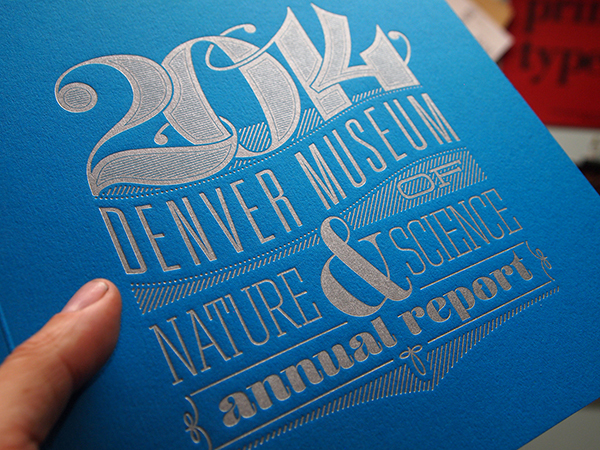 Keep up the phenomenal & beautiful letterpress work! A decade has passed and the creative gleam in Jason Wedekind’s eye still outshines even the brightest of metallic ink accent in his impressive printing portfolio. 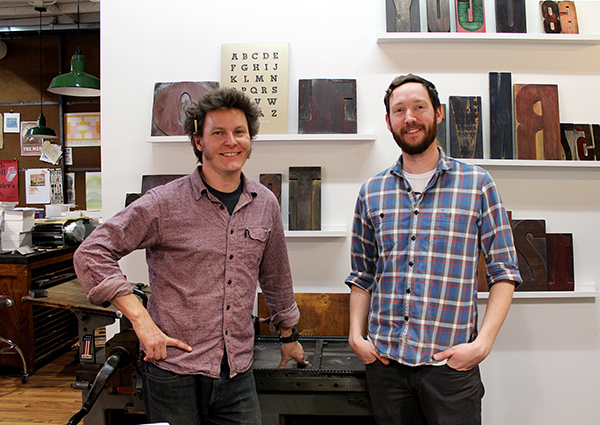 The Colorado-based printing realm of Genghis Kern has grown from two dozen cases of lead type & a single press to setting-up camp (and shop) in his dream workspace (not to mention acquiring a drool-worthy collection of hand-set and metal type). 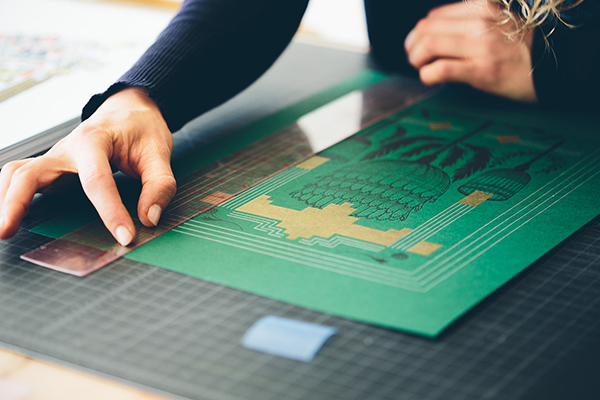 With one foot rooted in both the design & job world, Jason and his exceptionally gifted team have repeatedly pushed letterpress printing boundaries and amped up the creative oomph to their printed work. We stopped in to chat with Jason about the joys of printing, working with his mentor Tom Parsons, balancing life with two wonderful kids, and keeping up with the flow of community workshops. DECADE OF PRINTING INGENUITY I founded Genghis Kern 10 years ago this May when I started printing for friends while working as an art director for a small design firm in Denver. I still remember the day when I bought my first press, leaving with 24 cases of lead type banging around in the back of my SUV and saying “what the hell did I just do? I don’t even know if I like this?!? !” I had been introduced into this wonderful world by Tom Parson, Denver’s poet/printer grandfather of letterpress, and founder of the Englewood Depot Letterpress Museum. The letterpress bug bit hard and hasn’t stopped biting yet. I spent many a night printing all sorts of fun stuff while learning the trade. The firm I worked for got hit hard during 2009 and I was thrust into the world of self employment. With an 18month old daughter, it was stressful, but the payoff was rewarding. From day one it’s been a nice mix of design work and job work, with the goal being producing tactile work that makes both us and our clients proud. “One foot rooted in each world” is how a recent shop visitor described what we’ve built. CREATIVE IN COLORADO Our current shop is my dream space. I drove by it in 1999 and said “That’d be a cool place to work” and now we do. It was a Hispanic Furniture and Record shop 2 blocks from my house. 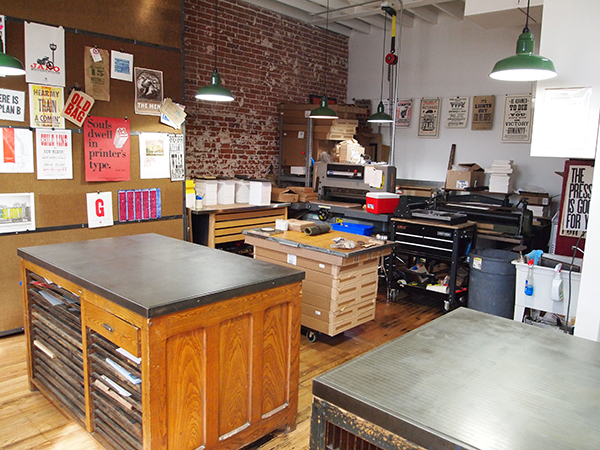 We have 2,000 square feet up front which we turned into a co-working space for creative types, and our 1,000 square foot print shop is in the back. When I brought my current pressman/designer Jeff Shepherd on over a year ago, he mentioned he had a windmill in his folks’ garage. My garage shop was full to the gills at that time, but I knew growth was in our future. You see, I had moved my design arm of Genghis Kern out of my bedroom 2 years prior into a shared work space with 4 other creative firms. When I brought a pressman on, they worked in my garage and I ran back and forth the 5 blocks from the new “office” to the print shop. It worked, but grew tiresome. Let alone having to keep my house clean in case they needed to pee. I started looking for a new space that would allow us to combine a print shop and office space, and reached out to the owner of the furniture store blocks from my house. It had been vacant since 2005. He agreed to my crazy plan and we broke ground in January of 2015, gutting the space and crossing our fingers that our floorplan for the pressroom would work out. Then the dominoes began to fall. We started with my original 10×15 C&P, an Asbern ADR-1 (German SP-15 Clone), a 10×15 Windmill, and a 30″ Challenge cutter. While doing the buildout Jeff saw a Heidlberg KSBA at auction that had inkers on it. My “dream” press. So we added that to the mix, quickly shuffling our floor plan to be to make room. Then one of the printers from our bimonthly printer’s lunch in Denver walked into our garage and said “Did you guys see that Vandercook for sale on the western slope?” Jeff ran inside and put an offer down on it. HIS dream press, a Vandercook 4. We figured we’d deal with the floorplan when we had a floor to plan. SOON. So that became our current shop. 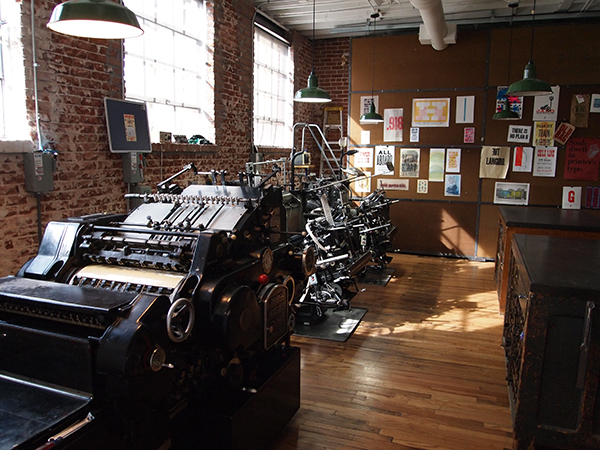 We set the two proof presses up in our “type alley” where we host an occasional workshop. It’s fun having different presses to turn to when something goes south. TL;DR: Our shop started out in my garage 10 years ago. 1 C&P and a cutter. I then moved 3 blocks and built my second “garage” shop, large enough to fit a C&P, Proof press (not yet owned), and a windmill (not yet owned), a stone and a cutter. What I neglected to tell my wife when we were designing the floor plan, was that if the presses were to move out one day, my dad’s vintage BMW motorcycle collection could slide right in where the presses once stood. INTRIGUED BY LETTERPRESS While working as an art director back in 2003, someone brought in a beautiful custom duplexed letterpress/foil stamped card and said they wanted to add 3 initials to their name in 6pt. 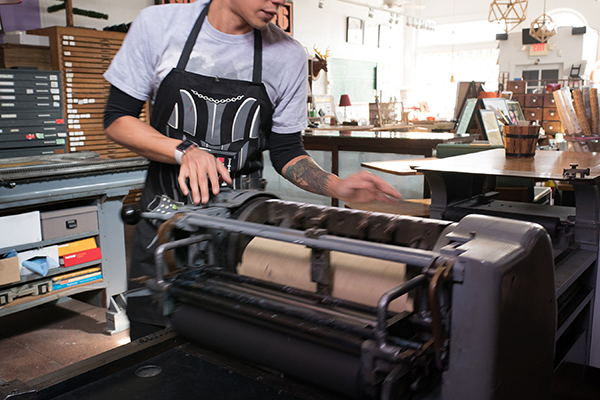 I looked at my print broker and asked “How the hell are we going to do that?” She told me letterpress. Hand-fed letterpress. I was intrigued. 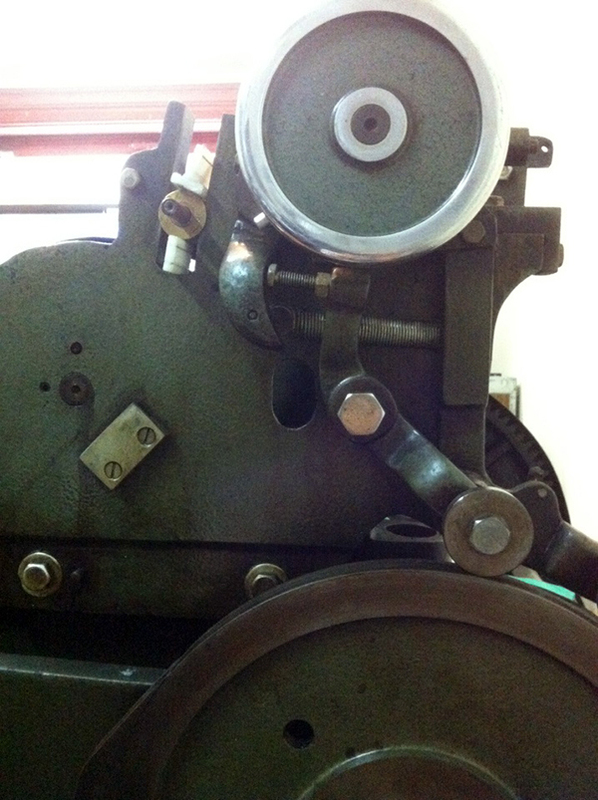 I knew of letterpress from the design annuals but had never been up close. That was about to change in a big way. I walked into the printshop of Tom Parson, our local “godfather” of letterpress and was transported to a different time. Tom printed that job and I said “I want a press (like every designer in the mid 2000s)” and he put me on the list. I asked him to teach me the process and he showed me how to do everything from hand washing plates to treadling. When it came time to print, he started kicking and I asked if I could try. He let me. The rest is history. I ended up kicking 600 cards in 40 minutes to which Tom asked “where did you learn how to do that?”. I told him my childhood was spent working in a decorating tool factory in Chicago, our family business which was started in 1908. Slave labor at its finest. But that slave labor instilled some hand eye coordination that I surely don’t complain about now. PRINTING MENTORS Tom Parson will always be my first mentor, but my inspirations are the people out there pushing the boundaries and keeping the art of letterpress alive like Jen Farrell of Starshaped Press in Chicago. A day rarely goes by when I’m not wiping drool of my phone thanks to her instagram feed. DESIGNED FOR PRINT I’m a designer and a printer. I’ve been hiring designers and printers. And we’re on a quest to turn some designers into printers. Feet in both worlds. THE CREATIVE PROCESS My design process has been greatly influenced by the door that letterpress opened to the typographic world. Being faced with a design challenge and combining passions when applicable is the best feeling. Whether it be typographically or texturally, or both. FULL TIME FUN, ALL YEAR ROUND Lately I’ve been printing a little more, but as the workload grows, I find myself printing less and less but enjoying the time in front of the presses even more. I’m also a member of the Amalgamated Printers Association, which is an incredible group of 150 printers from around the world who print 4x or more times a year. Each member gets a monthly envelope with everyone’s work in it. So creating for that keeps me on my toes and up to my elbows in type. PRINTING FEATS I’m proud that I’ve been able to grow a business from a passion, and employ people with similar passions. I’m also proud to keep these ancient machines and type from the scrap heap. Those two kids I’m trying to instill a work ethic in before it’s too late? They make me proud on a daily basis. I think I complained more about “helping Dad” when I was their age. Eva and Jasper? Thanks for putting up with me! BOXCAR’S ROLE The quality of Boxcar plates are unparalleled in my opinion. We have local photopolymer plate makers but letterpress isn’t their main focus. I know that if I get my artwork in on time, I’m going to get plates back quickly. And when there’s an issue with my plates, the help that the staff provides is top notch. SHOP TIPS Embrace your local community. The amount of knowledge gained by the “olds” out there who aren’t getting younger, by the way, is invaluable. And most of them love sharing. If there’s no active community that you know of, start one by inviting over some old printers for coffee and donuts. WHAT’S NEXT Just keep on organizing our new space. Offer a few more workshops. Streamline work flow. And continue to produce work we’re all proud of. A huge round of applause (and thanks!) out to Jason of Genghis Kern for letting us get a sneak peek at his wonderfully creative printing world. 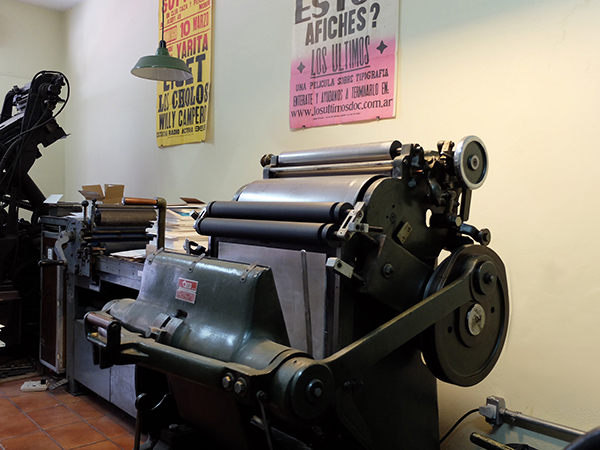 Across the globe, letterpress printing has captured the heart of many a printer, be they from Italy, Brazil, the U.K. and beyond. Each country has dipped its own pen and added to our collective letterpress history through the beautiful creation of presses and the ingenious pressman at the helm of these metal beauties. We reached out to some our printing colleagues to check out what unique international printing presses are founded in their country or rare presses they have had the honor to ink up. Some are of their own countries’ origin in production and some are foreign-born masterpieces. Either way, the global letterpress community grows stronger as more of these special presses are inked up and shared with others. Davide Tomatis – Italy – Archivio Tipografico our latest press is a Schelter&Giesecke – Phoenix IV. 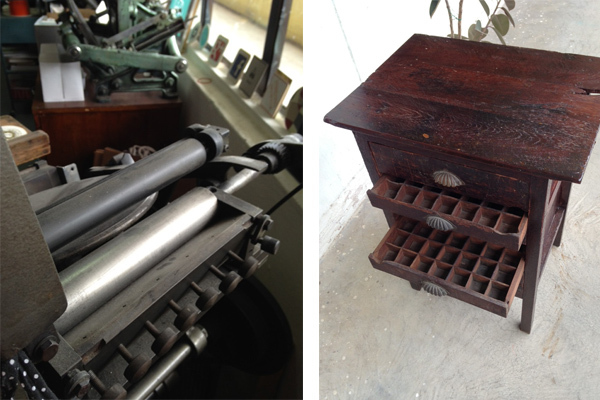 This press is a sliding platen press, designed and produced in Leipzig at the beginning of last century (around 1905). The maximum printable format is 40 x 66 cm and its weight reaches 1600 Kg. It has 4 inking rollers that work in couples: one couple inks the form on its way down and the other couple on its way up. It’s a very sophisticated inking system that we’ve only ever seen on this kind of press. It ensures a perfect inking of the form, as the active inking rollers are always evenly inked and don’t carry back on the form the sign of the type they just inked. 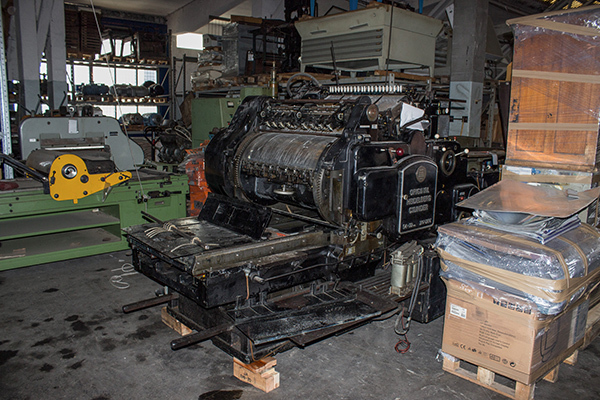 We acquired it in January 2015; our friend Luca of Anonima Impressori told us about a place near Bologna with an incredible collection of platen and piano-cylinder presses. We weren’t in need of any new press but – as you can imagine – we couldn’t help ourselves. We immediately went there and what we found was a very big, dark, cold and humid warehouse with presses everywhere. We never saw such a large place before. Most of the machines were quite conventional: Saroglia, Heidelberg, Nebiolo… but just around a corner, hidden by a Nebiolo Urania 70×100, Emanuele couldn’t believe his expert eyes when he recognized his dream press: the Phoenix! 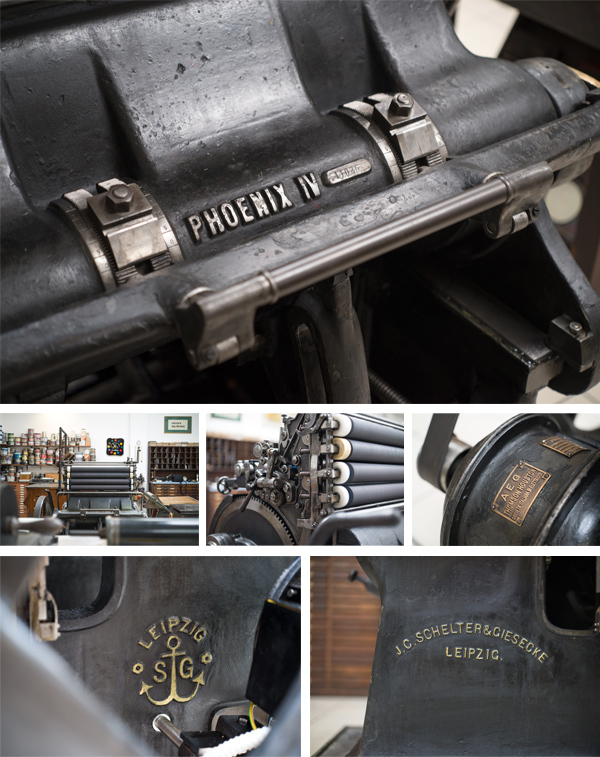 The Phoenix press series, produced by Schelter & Giesecke, are a particularly big and sturdy model of presses and one of the biggest ever built in the history of printing. As far as we knew the only working Phoenix in Italy was in Enrico Tallone’s printshop; what’s more, the model in the warehouse, was the biggest one of the series. No need to specify that seconds after the discovery a decision was taken: we had to make place for her in our printshop. We had a lot of work to do on her: she had no inking rollers, no engine, no cleaning system and she was covered in years and years of dust and dried ink. The restoration was quite a long and difficult process; as we didn’t have any manual or technical info we pretty much had to guess everything, from the size of the rollers to the right kind of engine. After a few tries we found the right size of the rollers and we were very lucky with the discovery of a super engine by our trusted and experienced electrician (a beautiful original AEG model). After that we engineered a cleaning system for maximum practicality of use. We had to come up with an original solution as the machine wasn’t originally equipped with any cleaning system: the printer had to dismantle the rollers after each use and clean them manually. 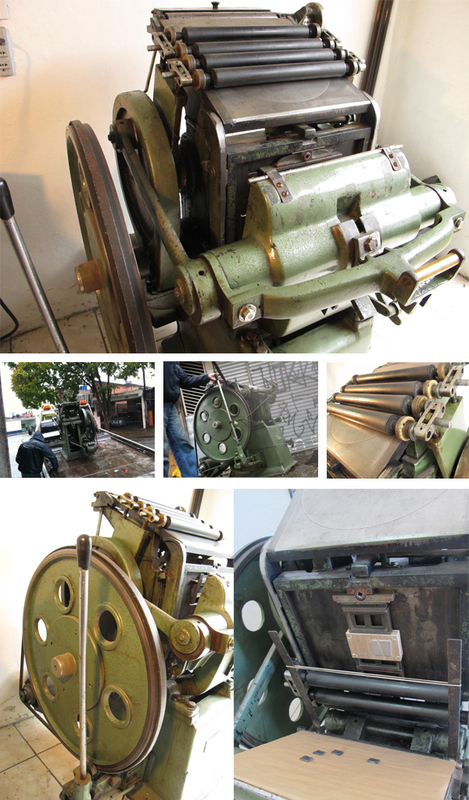 Lastly, to look as beautiful and as majestic as she deserves, we restored the amazing details embossed in cast-iron on the body of the machine, as Schelter & Giesecke mark on the side of the press and the name of the model on the front and we brought them back to their original golden color. Now the Phoenix press holds pride of place in our space: it’s the most elegant, powerful and historically relevant press we’ve ever owned, and we’re very proud for having brought her back into printing shape! Marcelo Pinheiro – Brazil – Carimbo Studio The first press we had was a small tabletop one. We found it with a guy who buys and sells graphic equipment here in Brazil. He also had some metal type with it (in fact he was going to sell it to the junkyard and have all the type melt). Its original colour was black, but they had it painted with this green hammered textured paint, that helps disguise imperfections, but on the other hand is good for cleaning with solvents. 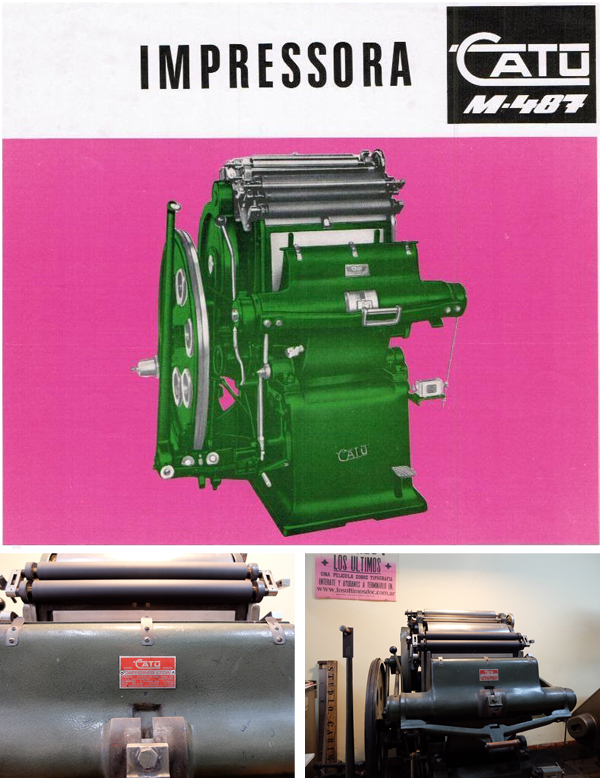 It is a Japanese press, manufactured by Osaka Printing Ink company (serial number L603) but we don’t know much more about it. Here in Brazil this kind of press is called ‘socadeira’ or ‘prelo de soco’ as you have to pull the lever to make an impression (punch = soco, in Portuguese). 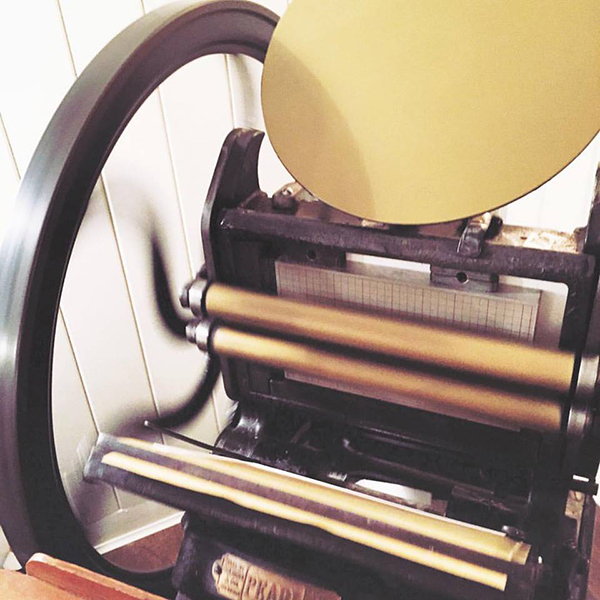 We are trying to get this press back to its glory days and we plan to use it to show people how letterpress printing works, demonstration and such, as it’s very simple to operate (once you have already made all previous adjustments). Another press we have in the shop is from a Brazilian manufacturer called Catu (meaning ‘Very Good’ in Tupi Guarani – Brazilian indians’ language). I think that “Minerva” – like the Goddess of Wisdom and Arts – is kind of a generic name that all platen presses are called here and on Latin America as well. The company was founded by German immigrants and started producing printing equipment in 1946 – and they still make offset equipment nowadays. It’s very common around here, but despite that, we can’t find much information about it – we don’t know when it was made and we don’t have a manual. It was still working as a printing press when we found it, but people also modify it for die cutting, thus removing all the inking system and all rollers. This model is often referred to as Minerva Catu 1/4 – as its printing size corresponds for a quarter of a 99×66 cm (Brazilian standard) paper sheet. We heard that its design is based on some German model, but we really don’t know. It’s a hand fed platen press and it has adjustments for rail height and printing pressure. We find interesting the lever for turning the flywheel on – and off, as it also works as a break. It has adjustable speed but we like to run it slowly and appreciate the work as we go! There are lots of these presses here in Brazil, but they ended up mostly used for finishing (die cutting, scoring, numbering). We have seen people painting Catus with all sorts of colors (black, white, red, etc.) but we like ours as it was made and its greenish industrial paint. But we made special leather grippers for the impression handle and the start / stop lever. It gives our press a much cooler look! Coincidentally, we ended up buying it from the same person that we bought our Heidelberg Windmill from, but it was totally random. It weights over 2500 pounds (1150 Kg) and has a printing area of 13 x 19 inches (335 x 487 mm). On our Catu we have printed album covers for a French / Brazilian Music label and we made posters for Association Typographique Internationale and for Englewood Letterpress Depot, besides several other projects. It is our press of choice when running larger pieces. The Catus are always accompanied by two side tables to keep the paper sheets: on one side you leave the blank paper and on the other one you put the sheets that were just printed as you are hand feeding the press. We find it easy to setup and it has a feature that I haven’t seen on other presses: it is possible to adjust the parallelism of the platen vs. the form. This is sometimes useful when adjusting makeready. The maintenance is somewhat curious, mainly because of spare parts… Even with just one model, not all Catu Minervas have exactly the same design on parts and holes. It is said that if you disassemble 3 Heidelberg Windmills you will be able to reassemble the 3 machines again perfectly. But if you disassemble 3 Catus and mix all parts you won’t get 1 single machine assembled back again! There are other machines on the Catu family though. 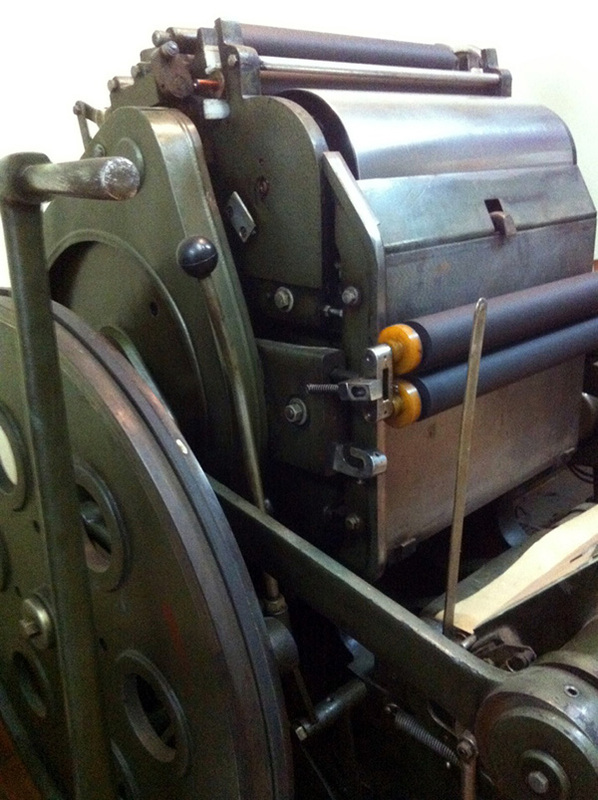 It has a younger sister: Catu Mirim (something like Small Catu) – as the name says, the printing size area is smaller. They also used to make cylinder letterpresses as well and that’s something that we are considering adding to our roster, too! 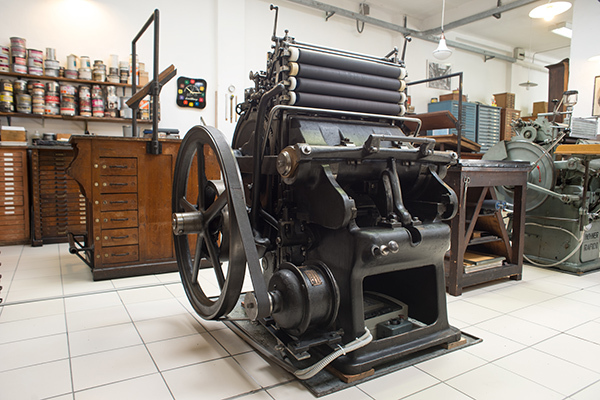 Pamella Farrell – UK – Farrell Press We currently have three beautiful presses in studio, a 15×10 Arab Press c1894, an 8×5 No.1 Cropperette Press c1888 and an 8×5 Adana Press which were all lovingly restored by my husband. I started out printing on the Adana, I’m mainly self-taught. I was the first letterpress printer in Ireland to reintroduce the craft to brides and grooms, offering letterpress wedding stationery in 2008 and the business has gone from strength to strength. As demand grew I knew I had to invest in a larger press. I searched throughout Ireland to no avail, I found out a lot of presses had been sold for scrap when litho printing became popular! I then looked at the feasibility of importing a press from the UK or the US. I was lucky to stumble across a sale ad for the Cropperette and the Arab press. They were owned by a photographer in London, UK, who was moving house and found them while emptying his garage. He hadn’t used them in over 20 years. Myself and my husband took the ferry over to the UK and drove to London in a van to collect them. The Arab had to be taken apart as it was too heavy for us to lift, lucky they were designed to be “flat packed” and with the manual my husband (who is a construction plant fitter), knew what he was doing. A nerve-wracking journey home and a few days later, the two presses were up and running with thanks to my husband’s skill. 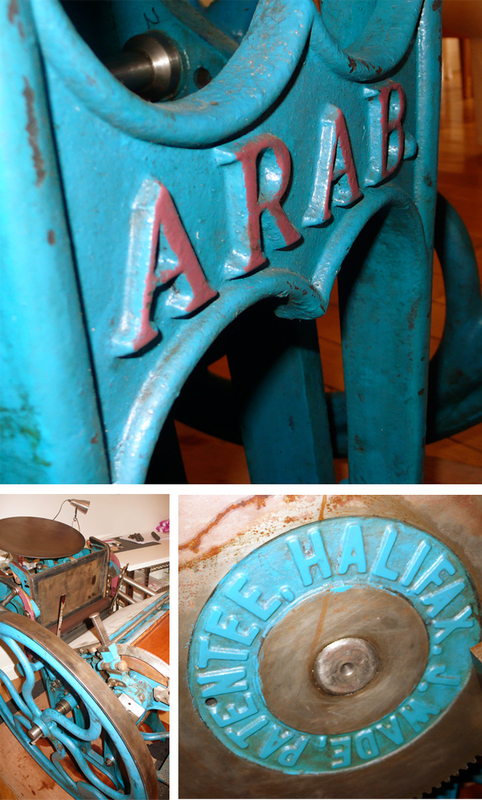 The Arab Presses were produced in the North of England and our Arab press is still painted the original blue with red accents and has a spoked flywheel which was later replaced by a solid wheel to reduce accidents. 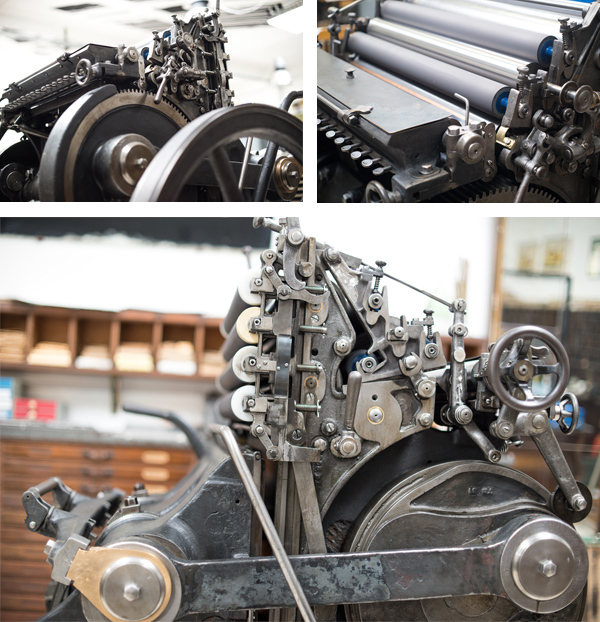 The Cropperette is a very rare British press built in Nottingham by The Cropper Company, if you have ever heard the term ‘to come a cropper’, a common phrase in Ireland and the UK, it relates to printers catching their hands in the printing press! The Cropperette is the more beautiful press of the two and has been very hard to find information on. It’s painted black with gold accents and a beautiful heart shaped foot peddle. It is lovely and free, very light to use with foot power where as the Arab is a very heavy press and difficult to operate by foot power alone. I have since added a motor to run the Arab press. The Arab press is the work horse which I use daily, the Cropperette is reserved for smaller jobs like labels and business cards and is used quite rarely and the Adana has become redundant. I have toyed with selling it but just can’t let go of my first letterpress. Fabiano Santos – Brazil – Pergam Press The press is a Model “Minerva Catu” also known as “Catuzinha” here. I’m not sure what year it was manufactured, but I believe it is around the 1960s. The origin of the Catu press manufacturer company has been through a family coming from Hamburg, Germany, and they began manufacturing the machines here in Brazil around the 1940s. Like the Windmill, it has all settings right at your fingertips, and it functions as an extension of our arms. It is very easy to adjust something on the press (according to the job being printed) because she “accepts” any setting. Even wire to hold up a few pieces of barnates tape for roller height adjustment. It is not widely used in Brazil. 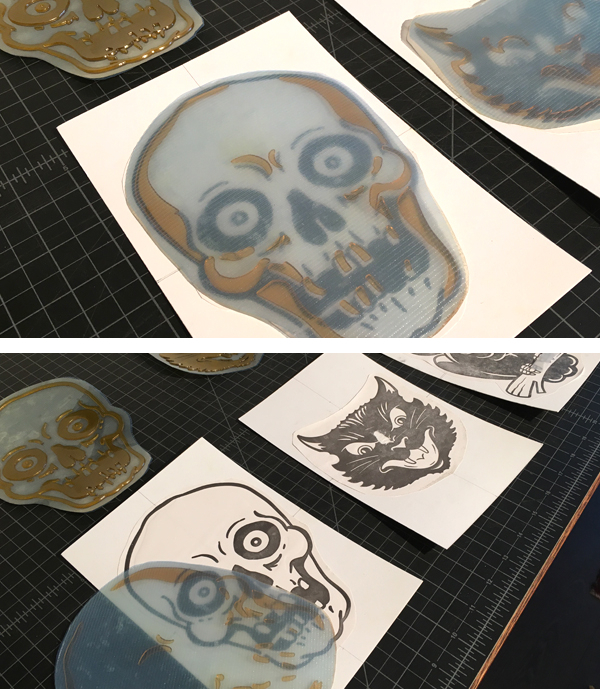 Some graphic design/print shops rarely use it for die cuts, but I have never seen anyone use it here to print other projects. 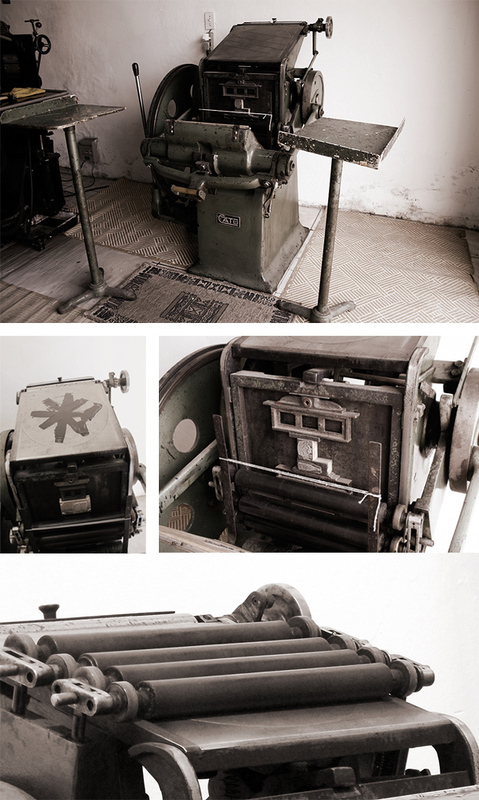 When I started looking for a machine to work with letterpress printing, I visited many old printers wondering where they had left their old equipment, and it was on one of these visits I met an experienced operator/printer who worked during the height of Minerva Catu. He had kept one of them in his garage. Since he had retired and no longer operated the machine, I bought it from him and now she has won a special place at our shop. Corby – Singapore – Papypress Our press is a Super Ace on the machine with serial number 3361 on it. The labels are all in Japanese, and it’s an 8” x 10” Platen. Is this machine good? Not really, it has quite a few silly features that I haven’t quite figured out yet actually. This is the ink fountain.The knobs, as you would already know, control the flow of ink. However this is not a cylinder inking plate. It is an ink plate that rotates like an Adana. That means I can’t play with colors like one would do on a Vandercook. So why have knobs? Looks cool though. This flywheel is like the tiniest thing I have ever seen. No bigger than 10” in diameter. Sometimes when I want to print with a heavier depression the platen jams up and I would have to give it a manual push. But once you get the hang of it you’ll know what to do. Nonetheless it’s a nice “semi-automatic” machine to have around and not as bulky as a C&P. We use if for smaller cards that have images really close to the edge. By hand feeding, I can minimize gauge pin space. 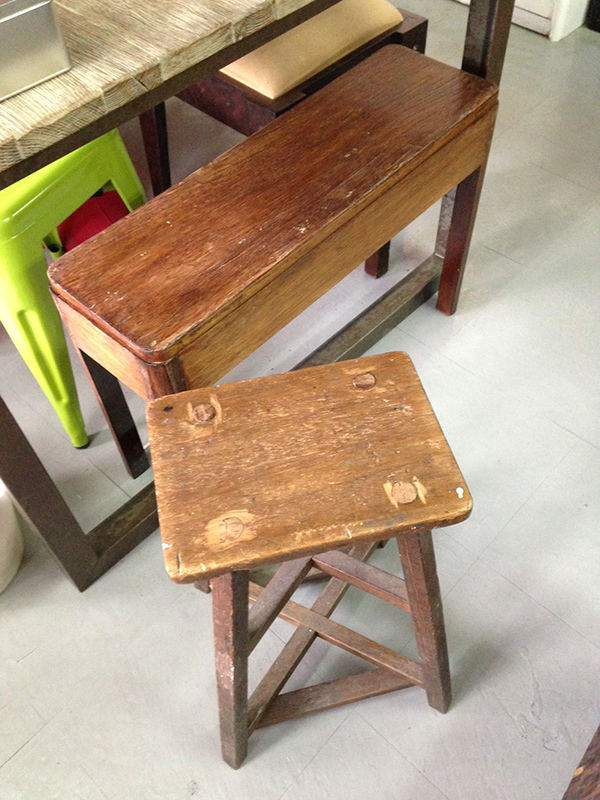 Once we were at an old print shop looking for wooden stools to use in the studio (these type of wooden stools are always found in old print shops in Asia). In the corner of the shop I first saw the inking plate in the corner, when I asked if the machine was still around he pulled the cloth off and showed it to me. He said why would I want something like that? Why not buy a digital machine? Best deal I ever made. Presses like these were common in our region, the more common ones were even more block looking. Space was always an issue in Singapore, and these machines were built with big motors and smaller flywheels. I guess deep impressions only came much later and it would have worked perfectly for “kiss” printing. If you have a unique printing press you’d like to share & gush about, join in on the conversation and post it in our comments section! For those curious enough to venture into the beautiful and gentle rolling hills of the Scottish countryside, a thirty minute serene drive southwest from Edinburgh will find you in the company of friendly smiles, a easy-going pace of lifestyle, and the private farm workshop that is The Hunter Press. 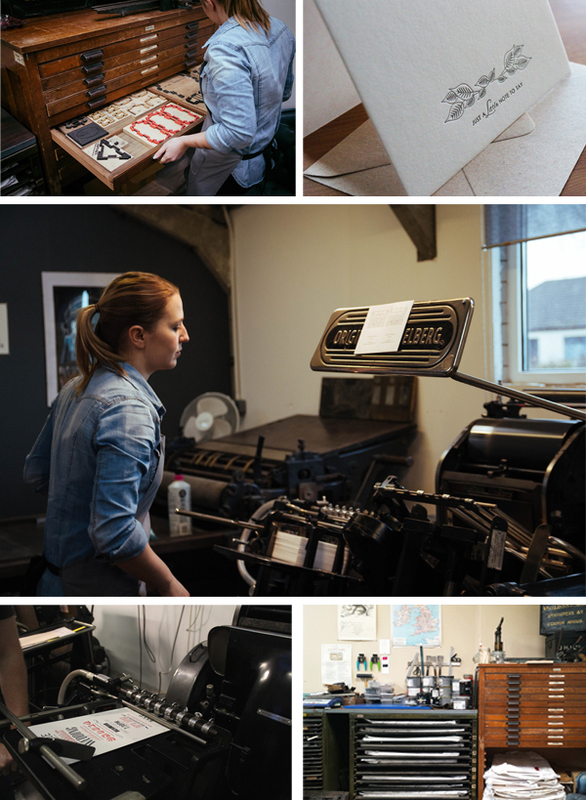 Lyndsey Hunter is the energetic entrepreneur manning the presses there and she let us in for a tour of her printing paradise — a true gem found in the heart of Scotland. 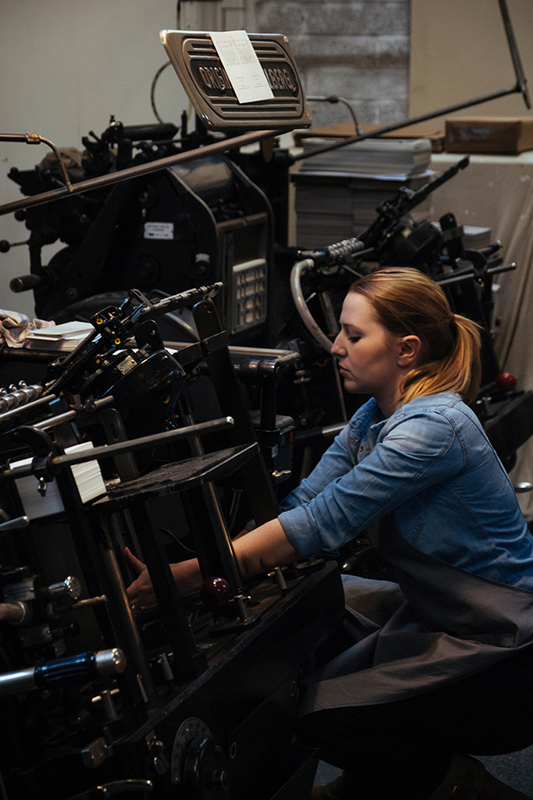 She sat down with us between ink runs to talk shop, about her passions as a printer, and bringing more letterpress to the Scottish community. THE LOCATION The print studio is located on an arable farm just 12 miles outside of Edinburgh. It’s a nice peaceful spot, not too far from the nearest town but quiet enough to feel as though we’re in the countryside. The print space is adjoined to my husband’s blacksmiths workshop so things can get a little noisy at times. We’re currently restoring a 300 year old property further north in Highland Perthshire which we plan to relocate to within the next year. The print studio will then be located in one of the adjoining cottages. I like to have a central hub which I can access from every point within the studio. Ours is a large prep/finishing table which often doubles as a set up area, computer station and photography surface. SHOP SIZE 500 square feet. FAVORITE THING ABOUT THE SHOP It’s quiet on the farm, away from traffic and city hustle and bustle, which really fuels my creativity. Within the studio, my favourite thing would have to be the old type cabinets which are used to hold surplus paper stock and our cutting dies. The drawers have taken a bit of a beating over the years, but add so much warmth to the space. FLOORING MATERIAL Sturdy painted concrete below the printing presses. We added some comfy hard wearing carpet across the rest of the space. The studio can get really cold so it’s nice to have a little bit of comfort during those cold months. TYPE OF SHOP Commercial but closed to visitors. THE PRESSES 3 Heidelberg Windmills 10×15, one of which has been converted for Foil Printing, 1 Harrild and Sons Proofing Press in need of full restoration, and we are hoping to replace one of the Windmills with a Korrex Berlin Proofing Press very soon. MOST VALUABLE SHOP TOOL Not a tool exactly but I definitely couldn’t run things without my wood burner on those chillier days! I’m not too sure how I managed without it at the beginning now. FAVORITE INK + COLOR Ink of choice would be VanSon Rubber Based Inks. I often use oil based for specials. Current favourite colour to mix would be mint green. CLEAN-UP ROUTINE Clean up is my least favorite part of the day! Luckily the Windmills are fairly straightforward to clean. I use a water-miscible roller and blanket solution with cotton rags and blue roll. OIL OF CHOICE Castrol Magna 150 Mineral Circulating Oil. CLEAN UP RAG OF CHOICE Old tshirts and sheets donated from the family. PIED TYPE A very small amount of odds which we picked up with the presses. BOXCAR BASE + PLATE SYSTEM I always work with Polymer Plates KF95. I had a couple of aluminum bases made locally when I started printing in 2012, they’re still going strong. WORKSPACE ORGANIZATION TIPS Keeping things clean, especially the ink station. I don’t like to leave the studio without carrying out a full ink clean up ready for the next day. I also like to file and label all polymer plates from past projects. PRINTING TIPS I’m completely self taught so I feel as though I’ve ticked my way through every mistake in the book and I still feel like I learn something new every day. It’s been said before but ink application was a big lesson! I started out using way too much ink, which in turn led to me wasting a lot and also spending too much time adjusting the roller heights. It’s best to start with a minimal amount of ink and build up to the desired effect. It’s much easier to add to than to run out and have to remix an entire custom colour. And always mix slightly more than needed (custom colour) in case of reprint. Oh, and oil those machines regularly! A huge round of thanks out to Lyndsey for this wonderful look inside The Hunter Press! Check out Lyndsey’s Pinterest page to see more of her work and inspiration! 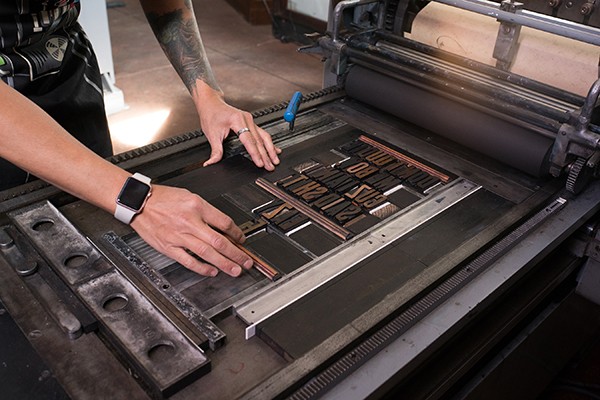 When best friends Britt Madden and Ava Goldberg of Banshee Press set-up shop in the creative & booming city of Denver, Colorado, they sought to foster the true tradition of letterpress by raising the bar for elegance, quality and beautiful craftsmanship. Fast forward a few years later and the magnificent duo still prints perfection, adds to printing ephemera collection, and heckles one one another in good fun. The brilliantly cheery pair sat down with us to catch us up on the next moves for the shop, properly cut paper (the foundation for success!) and why you shouldn’t print & mix colors alone at night. 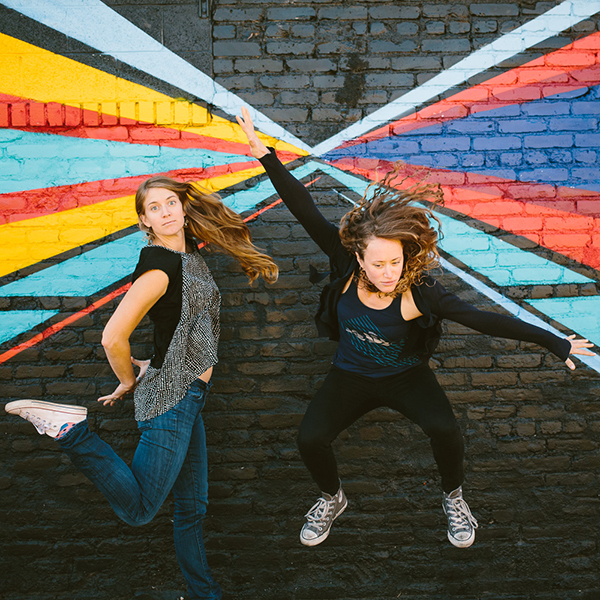 BUILDING FROM THE GROUND UP We are a duo (Ava & Britt) born and bred in Colorado. We met in high school and have been best friends ever since. After college, many travels and odd jobs we decided to unite our creative talents and work a job we loved and built from the ground up. We both majored in print, and decided letterpress was a perfect channel for our perfectionism and design dreams, so creating Banshee was an obvious move. Out of the studio we take advantage of all the adventure Colorado has to offer and spend our free time outside with our friends and family. THE FIRST TASTE OF LETTERPRESS Britt didn’t have letterpresses in her school, and once she graduated decided that she needed to learn. She bought a C&P 10×15 New Style on Briar Press and taught herself in her garage. Ava’s school did have letterpresses and she learned to use them while in college. We maintained our practice the best we could until we began Banshee with the purchase of our second press, the Vandercook Uni I.
CREATIVITY IN THE CENTENNIAL STATE Our shop is located in the RiNo (River North Arts District) of Denver. It’s a concentration of creative businesses, including architects, art galleries, designers, furniture makers, illustrators, wineries, breweries, sculptors, photographers, and an array of studio spaces. The buildings are covered in murals and color and the streets bustle with evening nightlife. 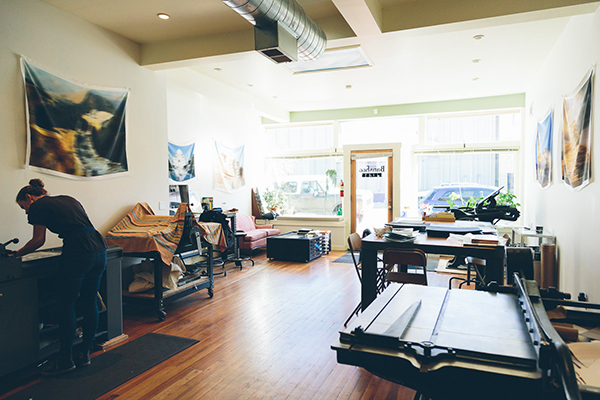 Our space is full of natural light, plants, and presses, and we enjoy having people come and go as they walk by. Our favorite thing about it is that we can use the space for all of our creative endeavors, not just letterpress, and encourage our friends to visit us to do so as well. 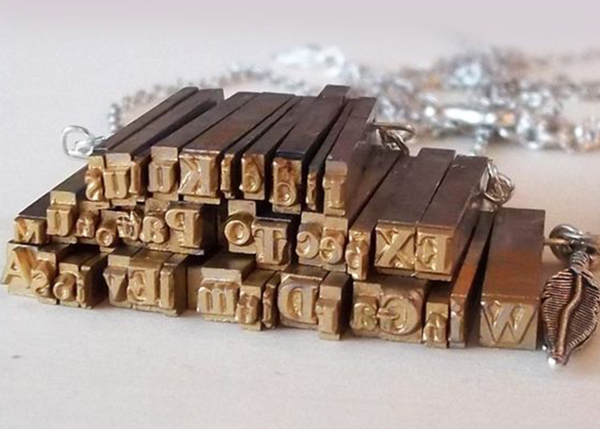 MEET THE PRESS FAMILY Our first press was a Chandler and Price 10×15 New Style. We now additionally have a Vandercook Universal I and a Heidelberg Windmill 10×13. DESIGNED FOR PRINT We are both designers and printers and we print designs provided by our clients as well. 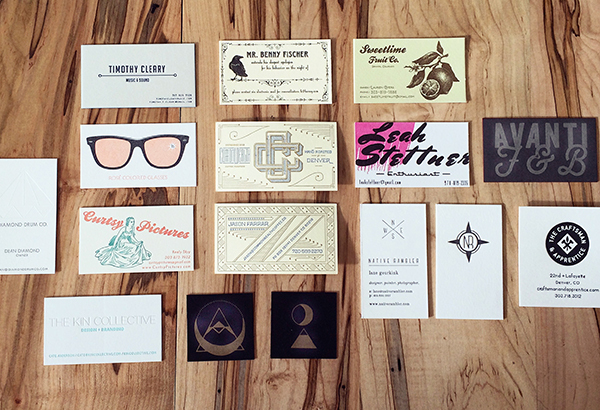 We have a quirky aesthetic, and enjoy designs that utilize the unique capabilities that letterpress offers. THE CREATIVE FLOW Normally we begin any design job with close conversations with our clients. The more information we can gather, the faster and more efficiently we can design to their needs. It saves us energy and them money. We then move into our brainstorming sketch phase where we put whatever our brains come up with down on paper. After a “would you want that to be your logo?” elimination, we come back to clients with a variety of ideas that we narrow from there. Sometimes we know that either Ava or Britt will be more of a fit for a particular job and will work solo in those situations, but never without feedback from the other. PART-TIME PARADISE We do not print full time. Britt has two young kiddos that capture much of her attention and Ava owns and runs her own business as well. Printing full time is something we wouldn’t mind, but at this point in our lives is not something we can make the time for. 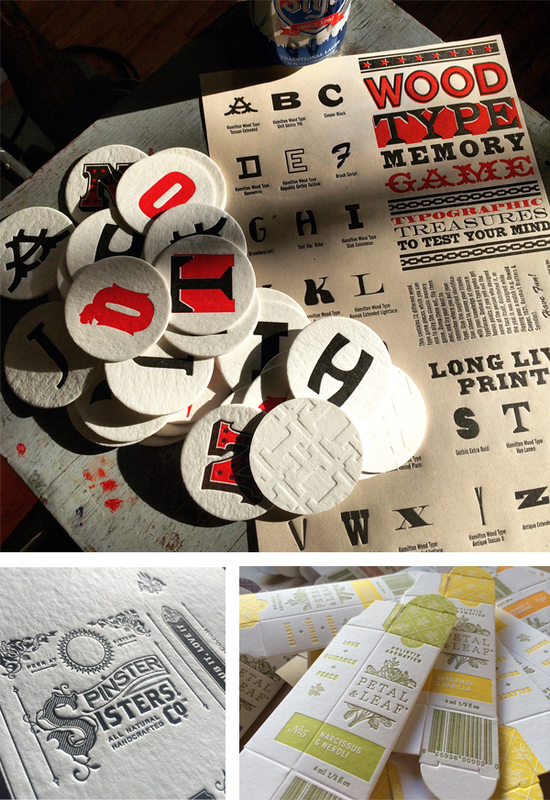 PRINTING FEATS Making it onto Boxcar’s blog! 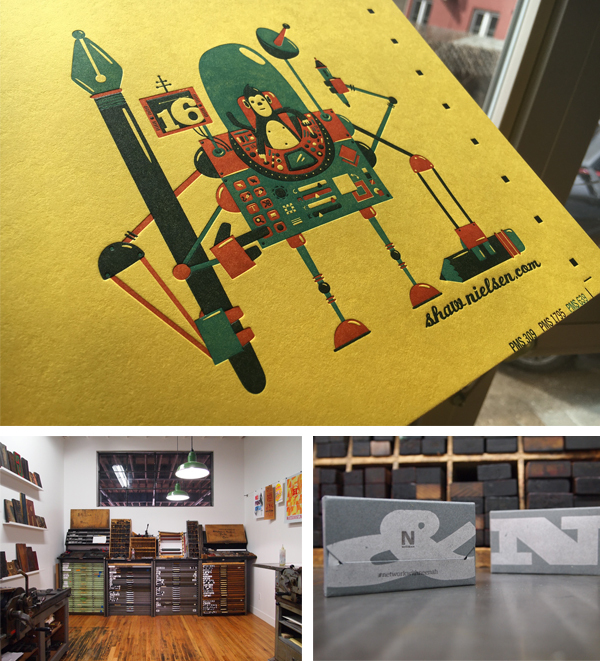 For the past two years we have published an artist series of letterpress editions that we are very proud of and enjoy doing immensely. We recently purchased a Windmill and have taught ourselves how to use it. And finally, we are best friends in business and we still love each other with all our hearts. BOXCAR’S ROLE Boxcar is our patient, kind, and understanding babysitter. We know the rules, and yet, we sometimes break them. They always call us with a smile to remind us of our errors before we make them. They have kept us from adding additional stress to our jobs, and consistently make this huge piece of our process easy. Thank You! SHOP TIPS Bow down to King Reggie and make him your friend. Properly cut paper is the foundation to success. And don’t mix and print color alone at night. WHAT’S NEXT In 2017 we are going to focus more on our own designs and begin creating a line of products all our own. It’s easy to lose yourself in printing other people’s jobs, and we want to keep our aesthetic a priority. It makes everything more fun. Immensely huge round of thanks out to Britt & Ave of Banshee Press for letting us take a peek at their printing paradise! 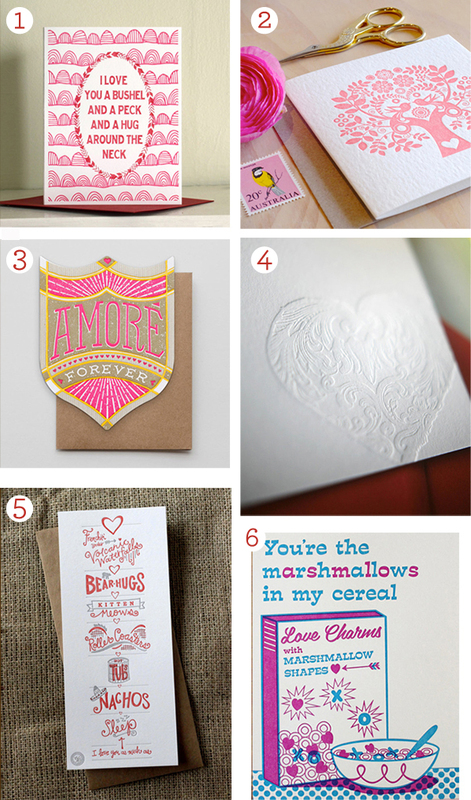 We count down the top 20 of ’16 Valentine’s Day letterpress cards and why not treat yourself (or your letterpress lovin’ sweetie) to a hand-picked (and pressed!) card or two for this upcoming Valentine’s Day! Let us know what you are getting your special someone this year in the comments below! 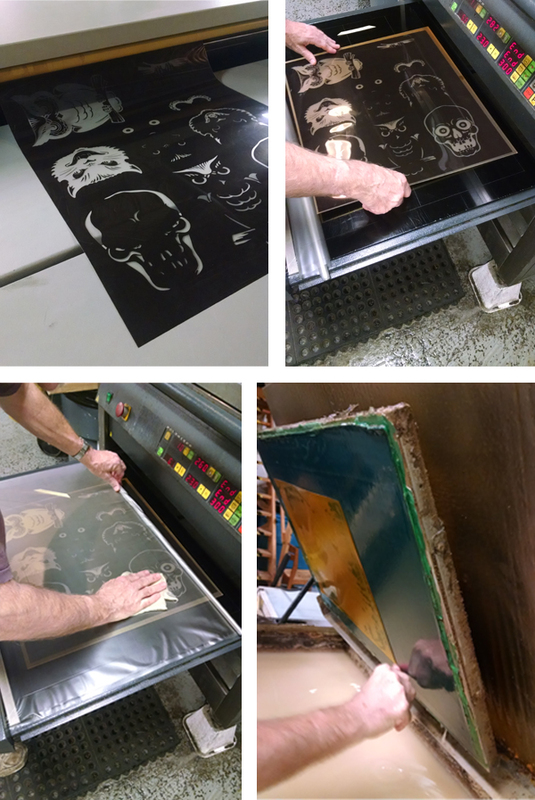 As soon as we found out the electric and spooky illustration designs of Primer were passing through our platemaking service department, we had to learn more about eye-catching letterpress poster designs. 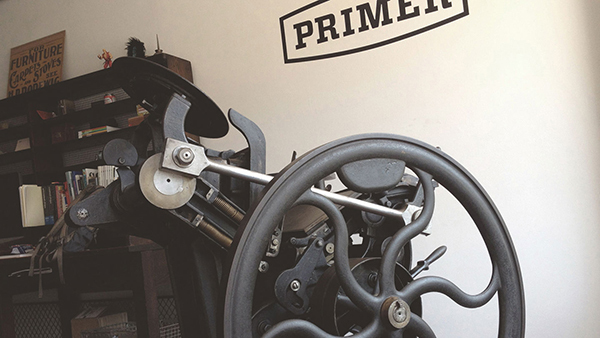 The printer behind Primer, Brian Isserman, and his wonderful wife gave us a sneak peek at the chilling yet beautiful tale behind these letterpress pieces. 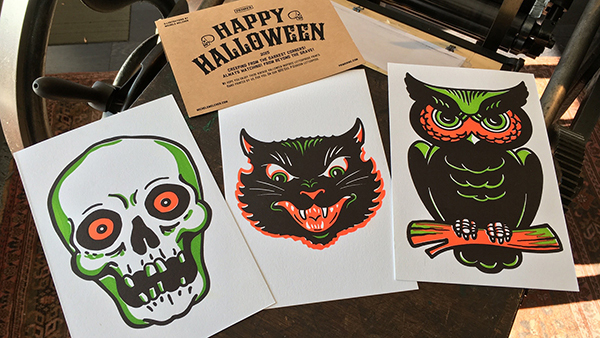 “Once we had the concept in place, we collaborated with the super talented Michele Melcher to illustrate a series of three iconic Halloween images. The flat graphic, off-registration look of those vintage Halloween decorations gave us a safe zone margin of error that helped us tremendously. This was our first multi-color print run and we wanted to create a design that was forgiving. It really worked out well. The prints that were in perfect registration looked awesome, the ones that were really off looked even better. The print run itself ran over 15 hours and for the most part went pretty smooth. We learned a lot from the experience and I am totally looking forward to tackling another multi-color job. Everyone really loved the prints. We received numerous calls and emails and got lots of social media love. “So, how do you keep everything in register without crop marks? Boxcar sent us a large press proof. We cut out the individual images and spray mounted those proofs onto our paper. We placed a small piece of tape on the front of the plate and aligned it face down onto the paper. Once in position we removed the sticky back of the plate and ran it through the press. The plate would then attach itself to our base. We then carefully peeled off the paper and tape, and we repeated the process with each of the 3 plates per illustration. Using the master proof helped keep all of the plates aligned. Huge round of thanks out to Brian and his lovely wife at Primer for letting us get a closer look at these brilliantly colored poster designs!